ZTE ZXR10 8900E series core switches are high-end modular switches featuring big switching capacity, full L2/L3/MPLS service capability, high-performance, superior reliability and enhanced security. ZXR10 8900E series switches are designed for the core/aggregation layer of campus network or Datacenter core. ZXR10 8900E series switches include four models: ZXR10 8902E, 8905E, 8908E and 8912E. ZXR10 8900E adopts advanced hardware architecture and is capable of providing up to 48 10GE interfaces per slot and 40G interfaces. In the future 8900E will be able to be smoothly upgraded to provide 100G interfaces. ZTE ZXR10 8905E is Modular Chassis L3 Routing Core Switch supporting 5 Service Card slots. ZXR10 8900E supports Virtual Switch Clustering (VSC), which means the virtualization of multiple physical switches into one logical switch. VSC enhances cluster system capacity and port density, and at the same time simplifies simple topology and eases administration. Multiple physical switches can be interconnected through normal line cards. The 80KM interconnection capability makes it possible to implement remote IDC backup. The bandwidth of the VSC interconnection can reach 320Gbps, eliminating any possible bottleneck in the VSC system. The forwarding inside VSC system is optimized so that there will be least amount of traffic passing between VSC members. 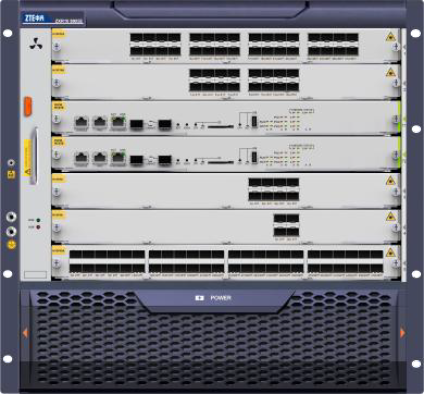 ZXR10 8900E supports diversified features, including full L2/L3 features, multicast and MPLS L2/L3 VPN. ZXR10 8900E supports complete L2/L3 multicast technologies, including administratively scoped multicast, MVR, IGMP Snooping, Filtering, Proxy, Fast Leave, IGMP,PIM-DM/SM, PIM-SSM, DVMRP and MSDP. All these features help Enterprise users to deploy multicast applications such as video conferencing and video surveillance. With distributed modular design, non-blocking switching architecture, and brand-new big-bandwidth fabric, ZXR10 8900E is an advanced core switch in the industry. Each single slot of ZXR10 8900E can provide at most 48*10GE interfaces or 8*40GE interfaces. In the future 8900E will be able to be smoothly upgraded to provide 100G interfaces.